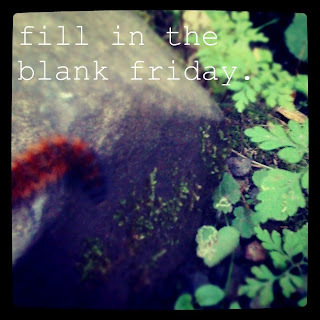 Linking up with Lauren at the little things we do again for another Fill in the Blank Friday! The best thing I did all week was take an evening walk with Ryan, Brock and Sonny. Knowing we will see Ryan's friends and family in a few weeks make me super happy. Pets are perfect snuggling/cuddling buddies. Loving Ryan completely and being completely loved in return is the best thing about my life. With the cooler weather I am looking forward to crisp air, fires in the fireplace, Halloween, and Pumpkin Spice Lattes from Starbucks. Something that is on my "wish list" right now is a 50-200mm lens for my DSLR. This weekend I am going to relax, clean house, and do STATs homework (which contradicts the original plan to relax! ).